OpenRoad Auto Group's "VLogger Challenge" Drive Nice Cars. Film It. Get Paid. 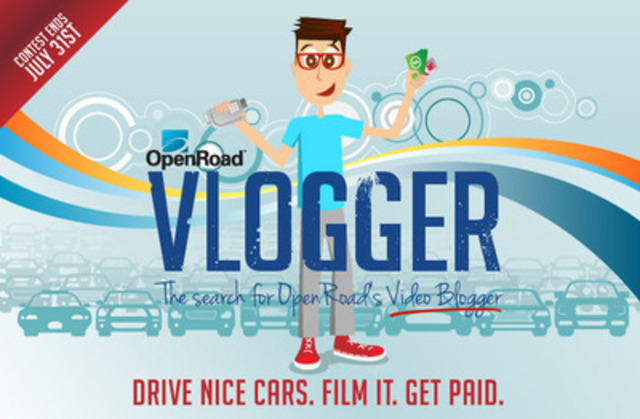 The "VLogger Challenge" from OpenRoad Auto Group, launched this summer, is a fun & interactive way to challenge local automotive enthusiasts to truly express themselves via video whilst competing for the job position: "The OpenRoad VLogger" with a perk package worth over 12 K ! VANCOUVER, July 16, 2012 /CNW/ - The "VLogger Challenge" from OpenRoad Auto Group, launched this summer, is a fun & interactive way to challenge local automotive enthusiasts to truly express themselves via video whilst competing for the job position: "The OpenRoad VLogger". The OpenRoad VLogger position features a base salary & extensive perk package, including an entertainment expense, company vehicles, free gas & complimentary camera equipment. This Video Blogger competition will be launched exclusively on OpenRoad Auto Group's Facebook page on June 1st, 2012 for exactly 2 months. Using the "VLogger Challenge" tab, entrants may submit their short yet creative video of themselves, stating why they should be chosen as the winner. The video can be filmed with any type of camera, including camera phones. VLogger contestants will be given the opportunity to share their videos with friends and give their network the ability to vote for their favorite videos. In addition, the audience will be able to participate as well by engaging in votes, likes, shares & comments, which will enter them into a contest to win a $500 gift card! This fun & exciting position will last a total of 4 months, which will require the winner to compose 32 unique video entries about anything related to the automotive industry & to assist, they will have access to over 180 vehicles carried by OpenRoad. *The winner will be chosen based on 3 key criteria: votes, creativity & personality. ** Position Contract start date: August 15th, 2012. Position Contract end date: December 15th, 2012.